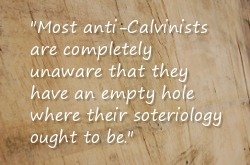 Email arrives from someone assuming I am (or everybody at SharperIron is) a Calvinist. Email poses question believed to be incriminating of Calvinists or unanswerable by them. Response from me offers biblical answer that is not especially calvinistic. Discussion becomes repetitive, overly heated or both, ends. A recent example appears below, with details removed to avoid identifying the sender. I’m including the exchange because, this time around, a reality hit home to me that hadn’t before: apparently, many fundamentalists think that anti-Calvinism is a complete doctrine of salvation. But anti-Calvinism is, at best, a thoughtful rejection of one particular doctrine of salvation. More commonly, it’s nothing more than a feeling of hostility toward doctrines only partially understood. As a result, many anti-Calvinists have no coherent doctrine of salvation at all. They have rejected lasagna from the menu but have walked away without ordering any alternative. In the early years of church history, there were men who denied the true humanity of Jesus. They were the Docetists, a significant branch of Gnosticism. They considered it blasphemous to imagine an infinite, holy, transcendent God contaminating Himself by assuming human flesh. This attitude reflected Greek philosophy, which held that matter is evil and that only the mind and spirit are good. This was a deadly heresy that was confronted head-on by the Holy Spirit in the New Testament Scriptures, especially in the writings of John. Note, for example, this statement: “By this you know the Spirit of God: Every spirit that confesses that Jesus Christ has come in the flesh is of God” (1 John 4:2). And, “many deceivers have gone out into the world who do not confess Jesus Christ as coming in the flesh. This is a deceiver and an antichrist” (2 John 7). The creation account in Genesis assures us that every physical, material thing God ever created, including the human body, was “very good” (Gen. 1:31). Moral, ethical evil is found in man’s heart (the center of rational thought, moral choices and self consciousness), not his body: “For out of the heart proceed evil thoughts, murders, adulteries…” (Matt. 15:19; cf. 12:34). The Apostle Paul echoes this thought with regard to those who follow demonic doctrines, such as “commanding to abstain from foods which God created to be received with thanksgiving by those who believe and know the truth. For every creature of God is good, and nothing is to be refused” (1 Tim. 4:3, 4). Doctor Luke, “the beloved physician” (Col. 4:14), Paul’s frequent travel companion and medical helper, was especially fascinated by the physical body that Jesus manifested after His resurrection from the dead. Luke assures us that it was “Jesus Himself [who] stood in the midst of them” having passed through the locked door into their hiding place (Luke 24:36). It was not “a spirit” that looked like Jesus (Luke 24:37-39). To demonstrate the genuineness of His physical body, the now-glorified Christ said to them: “‘Have you any food here?’ So they gave Him a piece of a broiled fish and some honeycomb. And He took it and ate in their presence” (Luke 24:41-43). The way He partook of this food immediately reminded them of the many times they had shared meals with Him during the previous three years. Similarly, the two disciples on the road to Emmaus “knew Him” when “as He sat at the table with them…He took bread, blessed and broke it, and gave it to them” (Luke 24:30, 31). Something about His gestures and mannerisms at meal times in His public ministry fully confirmed His identity to them. "Twenty-five percent of born-again Christians said all people are eventually saved or accepted by God." Read more about "Twenty-five percent of born-again Christians said all people are eventually saved or accepted by God." The Lord Jesus Christ, the second person of the triune God, who became the God-man by virtue of His virgin conception and incarnation, is the only human being in the universe who possesses a glorified body. 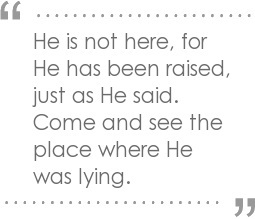 Consider for a moment the raising of Lazarus from the dead. This was one of the most spectacular sign miracles that the Lord Jesus performed at His first coming. Hundreds, if not thousands, of Jews were astounded by what Jesus did that day in Bethany near Jerusalem. John tells us that “many of the Jews who…had seen the things Jesus did, believed in Him” (NKJV, John 11:45). 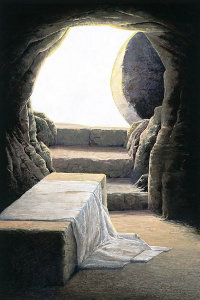 In fact, “a great many of the Jews knew that He was there [in Bethany]; and they came, not for Jesus’ sake only, but that they might also see Lazarus, whom He had raised from the dead” (John 12:9). But the leaders of Israel were terrified: “Then the chief priests [i.e., the Sadducees] and the Pharisees gathered a council and said, ‘What shall we do? For this Man works many signs. If we let Him alone like this, everyone will believe in Him, and the Romans will come and take away both our place and nation’ ” (John 11:47, 48). So they not only “plotted to put Him to death” (John 11:53), but as well, “The chief priests plotted to put Lazarus to death also, because on account of him many of the Jews went away and believed in Jesus” (John 12:10, 11). "Develop interpretive convictions, but do so out of a spirit of humility in the presence of mystery." Read more about "Develop interpretive convictions, but do so out of a spirit of humility in the presence of mystery." On Saturday, July 2, 1966, as a six-year-old boy, I told my mom that I would like to “get saved.” She replied that the next day following the sermon I should go forward during the invitation. That next morning my dad and I walked down the aisle of the First Baptist Church, and he helped me accept Christ. On Monday, we celebrated with fireworks.1 Seven or eight years later while at a youth retreat I felt the urge to re-pray the sinners prayer, but that didn’t end my occasional struggle with doubting my salvation.